It might not be everybody's cup of tea, but it's hard to imagine another plug-in with so few parameters that allows so much experimentation. Original sequencing concept. Great range of demonstrative presets. Potential for great results. Can be used to trigger instruments. Controls suit real-time modulation. Great control over sound levels. Audio Damage's extensive range of effects are among the most distinctive and affordable around. Up until now they've released just one instrument, the fairly conventional (but great) Tattoo drum machine. Instrument number two, Axon, is now with us, and it's one of their most original plug-ins yet. 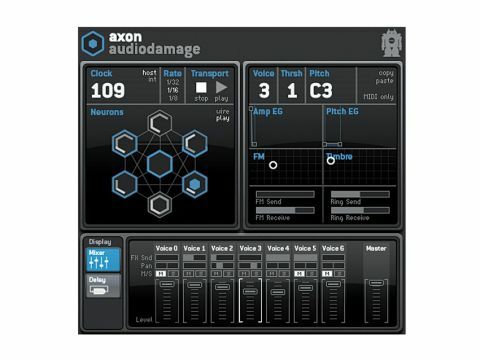 Axon is a synthesiser and sequencer designed for producing primarily percussive parts. That's where the normality ends. "Axon's unique style of sequencing produces genuinely original parts." Central to its concept is the Neuron Sequencer, a collection of so-called neurons, each of which can be connected to all the others and is able to send and receive pulses. These pulses are the key to the sequencer's operation. With the exception of neuron 0 (found in the centre), each neuron has a selectable Threshold value between 0 and 6. When the neuron receives the number of pulses defined by the threshold, it's triggered. Each neuron drives its own FM synthesis-based sound generator, and when it receives the specified number of pulses, it triggers the synth sound and fires out a pulse. The resulting rhythmic pattern is therefore defined by the interaction of the neurons. Neuron 0 can take it's pulse rate from the host sequencer or use an internal tempo setting, and it fires at a rate of either 1/8, 1/16 or 1/32. What happens next entirely depends on the threshold of each neuron, and their connections. Of course, results are what count, and Axon doesn't disappoint - it's a loop-producing treasure trove. Its unique style of sequencing produces genuinely original parts, and the nature of it means that as different neurons interact, the riffs and patterns can evolve over the course of many bars. And what about those synths? Well, they're all identical, offering up simple FM synthesis with a carrier and modulator, and a selectable note for each. The envelopes are for amplitude and frequency, and each offers simple parameters designed for generating popping, percussive tones. Below the envelopes are two X/Y pads. The first controls the modulation and ratio of the frequencies of the two oscillators, while the second - Timbre - lets you adjust the waveform. And it doesn't stop there: all of the synths can send their signals to both an FM bus and a Ring bus. In turn, the level of these central busses can be applied to any of the synths independently. As you can imagine, the results can be rather intense, and it's not uncommon to find some neurons pumping out far more audio action than others. To this end, Axon includes a mixer (with stereo delay on an FX bus), where you can set the pan, delay send and level for each neuron's synth. There are even mute and solo neurons to help edit the sounds for each and choose your parts. Our best tip is to switch off the delays while analysing Axon's presets - it makes it much easier to figure out which Neurons are doing what! While you can use Axon as a real-time instrument, we found that the resulting loops are the sort of thing that's perfect for rendering to audio. That way, you can sift through them later and pick out the best bits. It's not necessary to completely understand FM synthesis to make use of Axon, but to make the most of it, you should at least have a basic grasp of the concept. With this under your belt you'll have a much more thorough practical understanding of the plug-in. In FM synthesis one oscillator, called the modulator, modulates another, called the carrier. Adjusting the modulator will change the sound of the carrier. The sheer range of sounds this can produce is rather astounding. The key is learning the effects the modulator can have, and how to manipulate it to achieve them. While analogue FM synthesis is possible, it's very much a rarity due to various technical issues. FM only really came of age with digital boxes (Yamaha's DX7 synth being the classic example), so the resulting sounds are associated as being 'digital'. It's not uncommon for more powerful FM synths to have multiple oscillators/modulators and numerous ways in which to interconnect them, leading to further sonic flexibility. So how does it sound? Electronic bells, clangs, bongs, thudding basses - all of these are FM's forte. While Axon's FM implementation is simple, there's still a world of squelchy pings, bleeps and bangs to explore. Being essentially an innovative sequencer driving a bunch of fairly simple synths, you might be wondering what it would be like to use Axon to trigger other instruments. Happily, Axon can run in MIDI mode, sending out MIDI triggers that can be routed to other instruments - it's fascinating to use with synths or drum banks. Unfortunately, this isn't available with the Audio Units version, which Audio Damage put down to limitations with the AU format. You can also trigger the Axon synthesis section via MIDI, but that's a bonus, not a headline feature. It's hard to knock something so simple and ingenious, but we do have two tiny grumbles. Currently, the only way to set which neuron's synth is displayed in the Editor section is to click on the cell itself, but it would be great if you could see it when you're working in the mixer section and setting the levels too. Thankfully, Audio Damage have already scheduled this for a forthcoming update. And while there is an argument for only showing one synth at a time, this can make it difficult to quickly tweak various synths to create riffs. An optional GUI showing all synths at once would be a nice addition. So is Axon for you? As our audio demos demonstrate, it is primarily a percussive FM riff and percussion tool. But that's no bad thing. Anybody involved in electronic music, especially dance and ambient, will find much inspiration here. If you like playing with esoteric, fun and inspirational sonic toys, Axon is definitely for you. But if you struggle with unconventional approaches, you may want to steer clear of it. This plug-in isn't complicated, but it warrants a little concentration and experimentation to get the best out of. As for us, we're off to tax our neurons to the limit.